You can never understand and share the emotion of the bereaved one of the deceased if you have not yet undergone the same situation before. Maybe you feel the pain, but you can never fathom the depth of the root of their emotions especially the close-knit families and friends of the deceased. However, you can sure of help their inner wounds through helping them in the funeral and burial. You can help them in terms of finding the service provider of the funeral, help them in looking for affordable flower shops, help them in looking for inexpensive transportation, help them monetarily, and even help them post a notice to the public and inform the family and friends of the deceased. 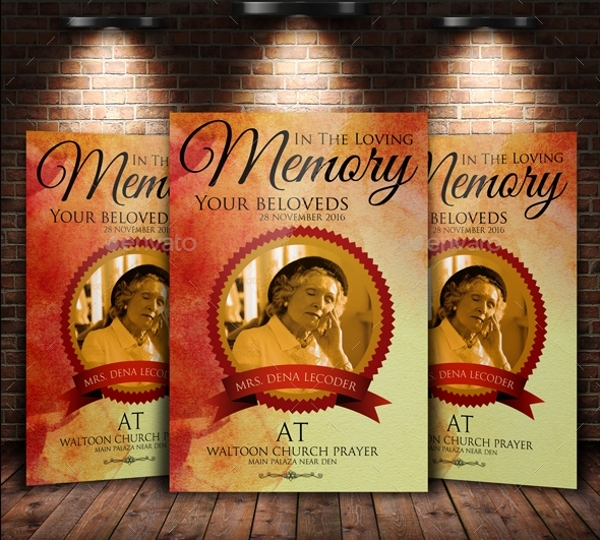 You may also see Multipurpose Flyer Designs. 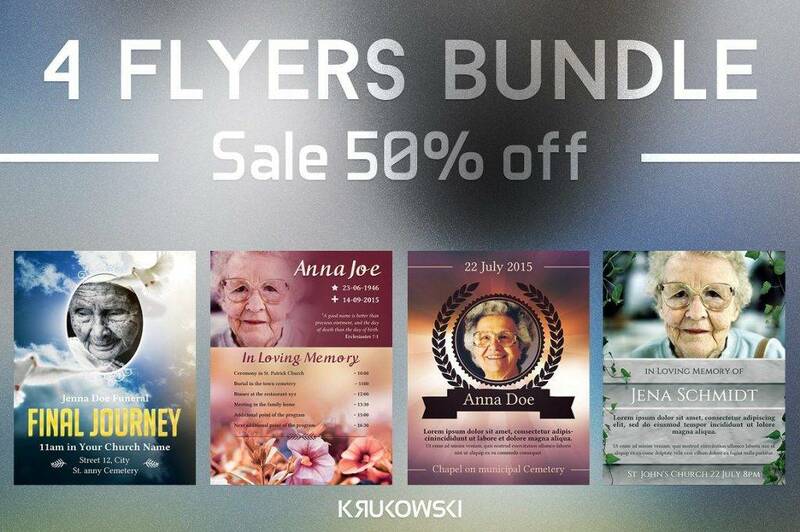 One of the things that you can help is through creating a funeral flyer. 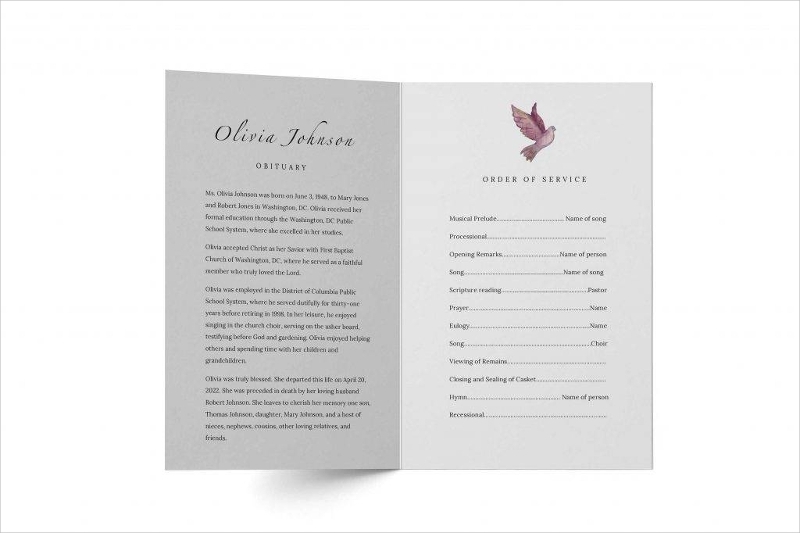 Funeral flyers contain information and key points regarding the funeral service and provide a summary of the achievements of the deceased. 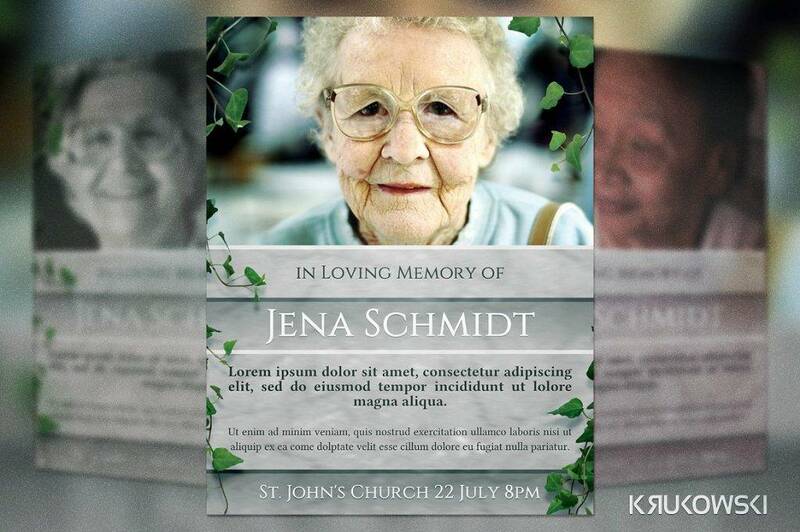 You can find a lot of funeral flyer designs below. Be sure to check them out. Losing someone is never easy and it can really affect your mood. You find even the routines and simple tasks hard to perform for you are still overwhelmed with a wide range of different emotions. On top of that, you may be the person in charge to arrange the funeral services. This entails heavy responsibility especially when the deceased one did not leave any arrangements for his or her funeral. But don’t worry; we will surely help you with the things you need to prepare for the funeral so you won’t miss any important detail. Below are the vital things you need to prepare for a funeral. Firstly, you must choose a funeral service provider who can arrange the funeral. Several factors are needed to consider in choosing the funeral provider are as follows: location, preferably the one close to the residence of the deceased; cost, which you can do perfect surveys and comparison with other funeral service providers; and reputation or the one that is most recommended by your friends and other people or those that already established its name in the industry by providing quality services to its customers that can be observed through customer feedback. Another thing, you must also ask the funeral service provider if they have discounts or promos or any package that you can benefit for a lower cost as compared to not having them in a package, but individually. Now that you have already decided on which funeral service you prefer, you need to give them the necessary information they need to make arrangements, complete the paperwork, and other important things in connection to the funeral service. 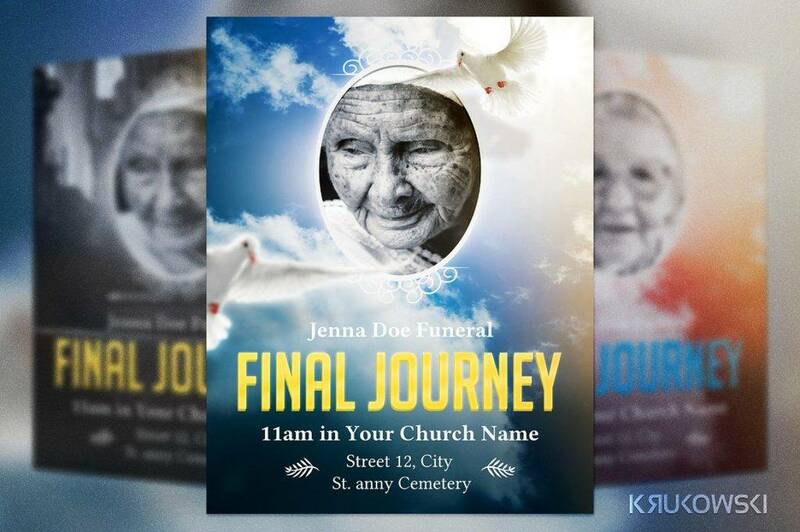 This information includes the following: the full name of the deceased, the place and date of birth and death, the next of kin of the deceased, your name and contact information as well as your relationship sample with the deceased, the preferred date of service, and many others. You have to provide this information so they will be the ones to make the necessary preparations for you. 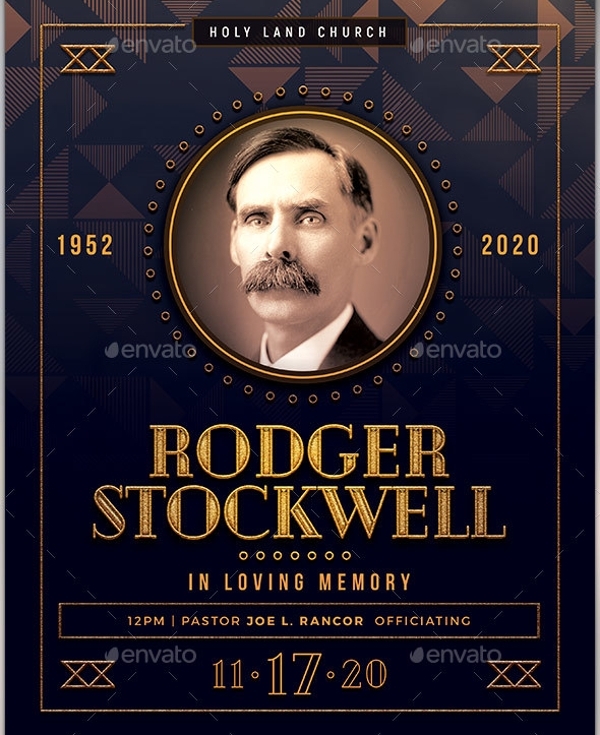 Traditional – This is also known as the full-service funeral, usually the most expensive among the types of a funeral, and usually involves a viewing or visitation, a funeral service with an officiant, and the entombment or cremation of the body. Direct burial – The body is directly laid in a simple casket, with a graveside memorial service as an optional plan, skipping the embalming and visitation. Direct cremation – In this type of funeral, the body is directly cremated shortly after the individual has died, and the ashes are transferred in an urn. You can have or not have a memorial service, but usually, a pre-planned service is done someplace outside the cemetery. 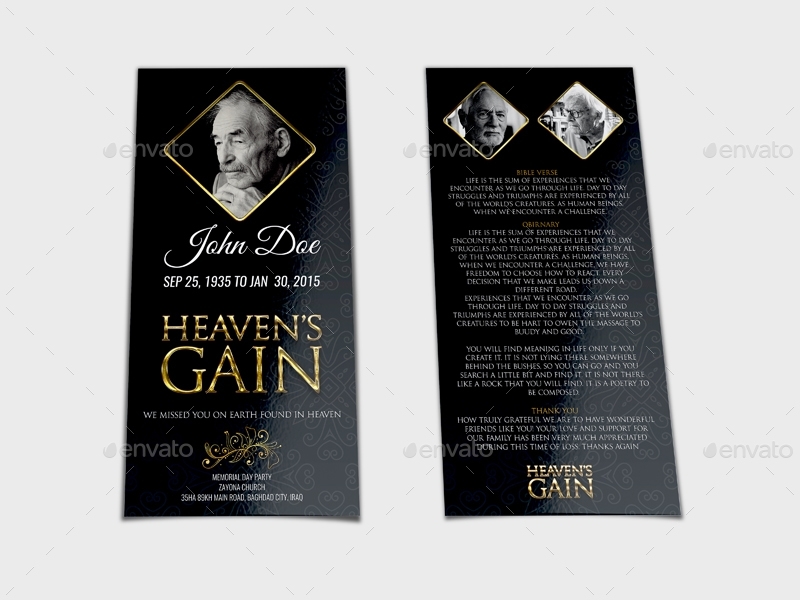 There are several factors on how much are you going to pay for the funeral service including the ceremony and burial, embalming, casket, and other arrangements they are going to make for the deceased. It is better if the deceased had already prepared the necessary arrangements and payments for his or her funeral. If not, you are going to figure out how to accumulate sufficient fund for the funeral service as most funeral service providers do not allow deferred payment plans. You may also ask for financial donations to your other relatives or close friends if you really do not have enough money to fund the funeral arrangements. Acquiring a death certificate is important since this document is needed for canceling credit cards, filing a life insurance claims, and many others. This is among the things that you must first acquire since this is a prerequisite of all other things relates to the arrangement of the funeral. The information presented in a death certificate include the following: the name of the deceased, parents’ name, marital status, the social security number of the deceased, and date, location, and cause of death. There are several ways on how you can request a death certificate such as requesting them personally, over the phone, through the mail, or through their online services. Posting an obituary online or in the newspaper is a way to let other people know, especially the close friends and relatives, regarding the deceased passing. Aside from that, it is also a way to pay tribute to the deceased. 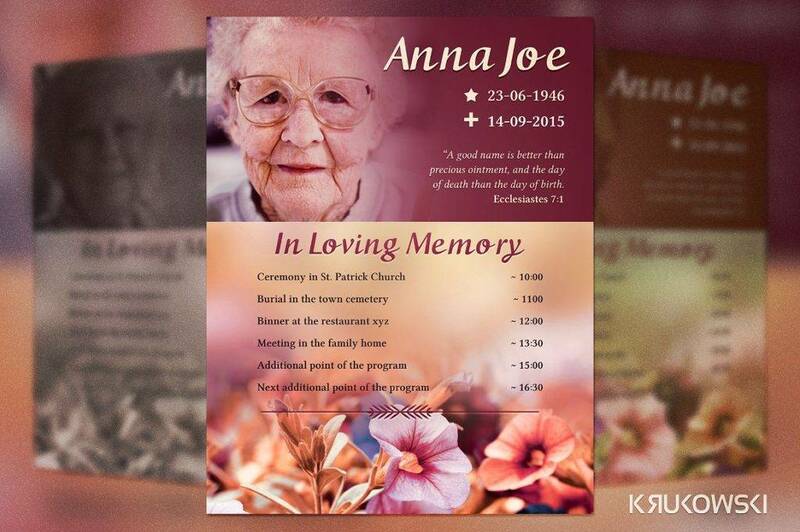 In newspapers, the obituary will run for 1 day, with the option of renewing it for another day with additional payment. Alternatively, you can post them online and have an indefinite access to the post. 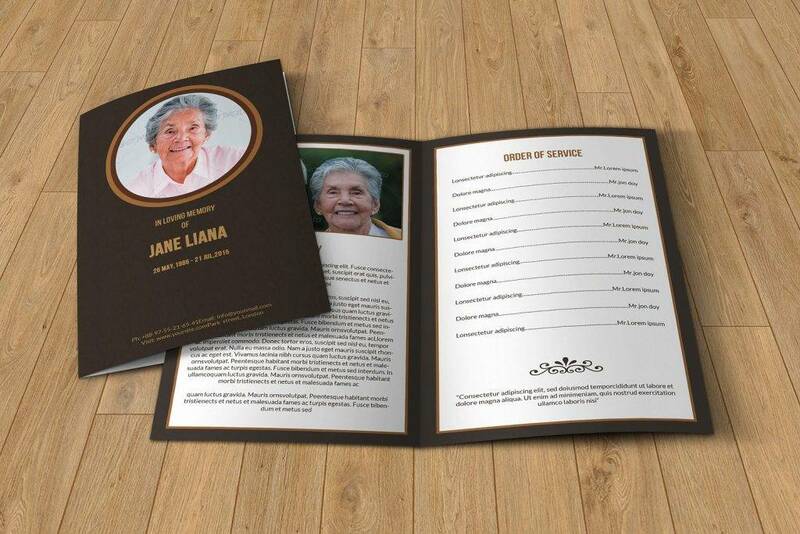 The information needed in posting an obituary primarily includes the deceased full name, age, gender, age, date, and place of birth and death, the immediate kin, surviving relatives’ name if any, accomplishments of the deceased, and any funeral service information you have gathered. 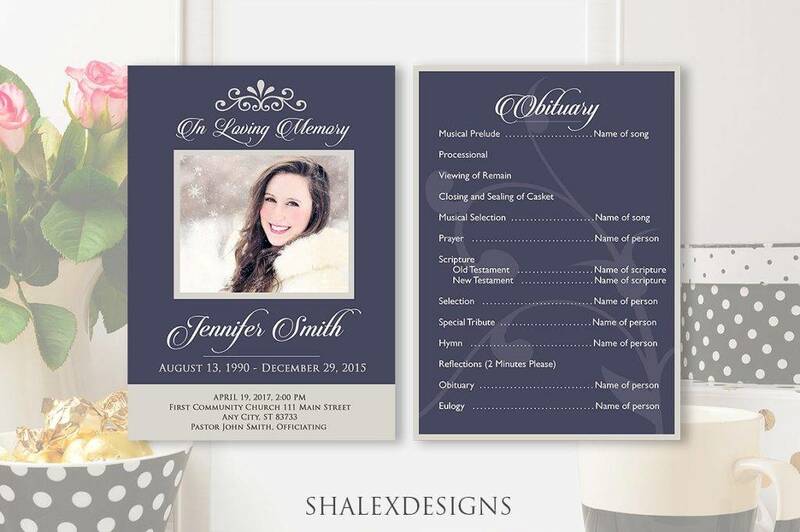 In notifying friends and relatives of the deceased, it is principally you and your family’s option on the number of visitors you allow depending on the size of the ceremony, may it be a small, private, or grand ceremony. The important people that are mostly invited in the funeral are as follows: family, friends, close neighbors, employer, close co-workers, and the officiant, if the deceased is considerably active in a religious community. Also, note that you also have to consider the size of the family in deciding how grand the funeral to be. Parallel to the viewings and visitation is a display of flowers. Sometimes, the arrangement of the flowers are included in the funeral service package, but there are also times when the bereaved opt not to include flowers in the package. There are a wide array of choices in the flower choices which includes the types of flowers you want, its colors, as well as the patterns you would want on your display. You may also choose the flowers in which you think that the deceased likes or the flower preferred by the majority of the family. You must also decide on the number of a flower to be displayed in the funeral service as well as the arrangements of the flowers. Transportation is also another important thing to consider in a funeral service. You can arrange for a car or limousine to transport the family and friends of the deceased or a larger transportation vehicle if there are quite a large number of attendants. This is to ensure that the relatives are close together and can provide comfort with each other or with the family. This is also to prevent hassle that may be caused when a certain family member is the one driving the vehicle, focusing only on the road instead of comforting the family. Your funeral service provider can also provide a transportation for an additional payment. Another option is to contact your municipal or city hall or have any connection to your locality in case they can help you and provide the transportation. Lastly, you can search online and book for drivers and transportation services near you. In planning for the cemetery arrangements, you must decide on the place of the burial. You need to look for and purchase a land in a cemetery or space in a mausoleum if the deceased did not make any funeral and cemetery arrangements. 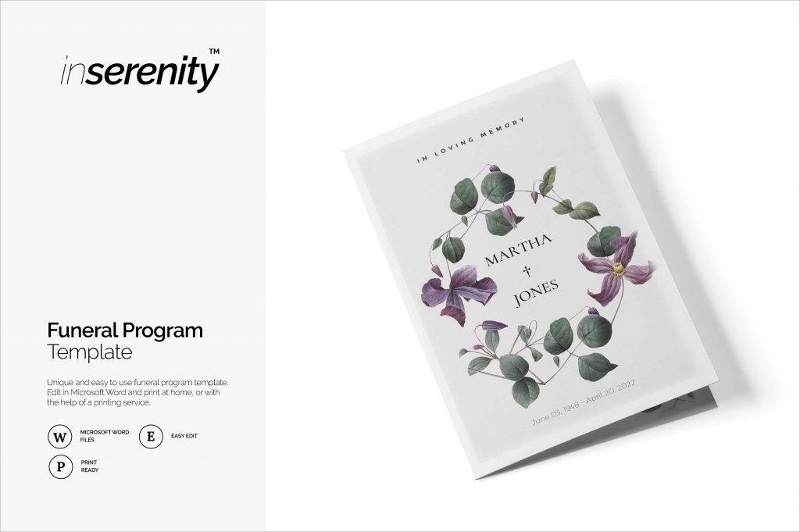 It is most likely that the funeral service provider you are connected with is affiliated or can recommend you with good-quality cemeteries. If the deceased is active in a religious organization, they may also be affiliated with cemeteries and can help you find one that perfectly suits the deceased or your preferences. They can also most probably assist you in the cemetery arrangements. Everyone will really come to an end point end in their lives, as death is absolutely inevitable. The hard part of the death of someone whom you know is not only the sorrow and deep pain but also the intense preparation of the funeral. Among the things that you must consider in the preparation of the funeral service are the following: choosing a funeral provider, providing information to the funeral director, deciding on the type of funeral, paying for the funeral service, getting a death certificate, posting an obituary online or in the newspaper, notifying family and friends of the deceased, buying flowers, arranging for the transportation, and making cemetery arrangements. 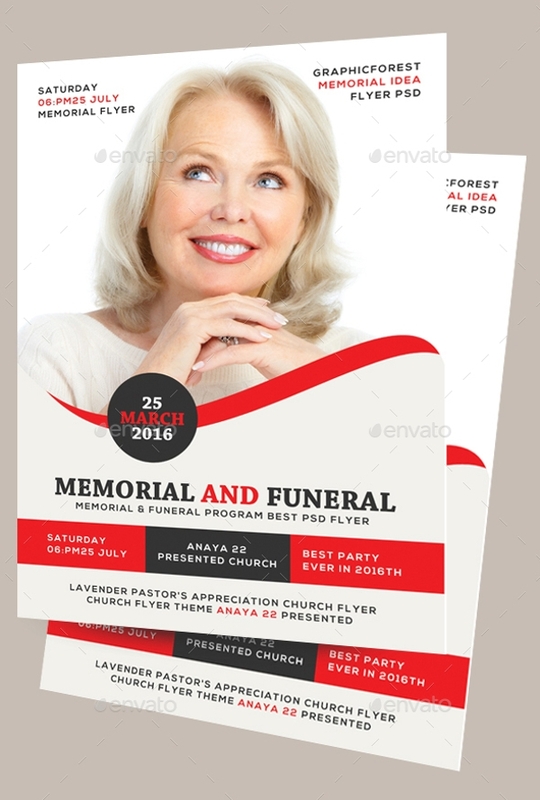 Aside from those, a funeral flyer is also needed to provide the key points to the funeral service. 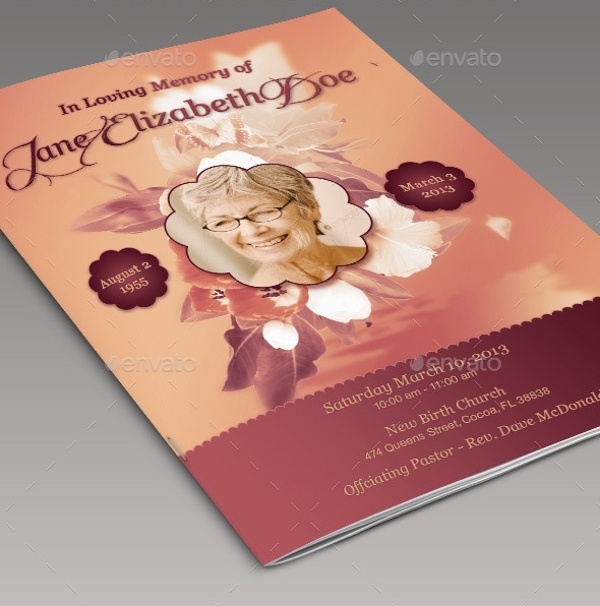 We do hope the example funeral flyer designs above will be of great help to your funeral flyer needs.